Here's a question from the forums posted by sarasosa: "I KNOW that for the majority of interviews a suit is the way to go, but there are situations when you will be inappropriately overdressed. (Yes, this is possible!) I am interviewing for a company where the atmosphere is casual for everyone right up to the CEO. I'm afraid a buttoned up suit will give off the wrong first impression. So how do you fit in and still look professional?" A pencil skirt and pretty blouse strikes the perfect chord for a casual work environment interview. 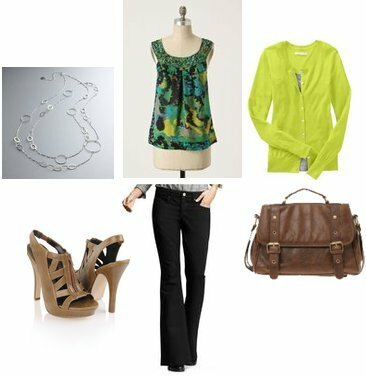 Bright colors show your personality while simple silhouettes show you're serious about the job. Top any modest, simple dress with a blazer and fun flats for a pulled-together look that's still laid back. What would you wear to a job interview when a suit isn't appropriate? Really great choices BB! I think these are also perfect options for super hot days when a black suit would make you sweaty and look disheveled. better to keep it cool, crisp, and classy! Terrific choices and like Liz mentioned, great warm weather options. I will never forget an interview I had a few years ago. I went in a demin dress. Granted, the interview was spur of the moment. Very nice choices, and I think the first was my favorite. yeah, i went for an interview once in dress pants and a blazer with a camisole underneath and was worried i might be too casual. but when i got there all the employees were running around in spaghetti straps and jeans or slacks. anyway i felt totally overdressed and like a fool. I love option 1! It's very pretty and totally work appropriate for most places I think unless you are in a very serious industry hehe.